Ready for some toe-tappin’ fun? We’re bringing a little Kentucky to KC. Come hear some bluegrass pickin’ and pluckin’ plus Bach’s Brandenburg Concerto No. 3. 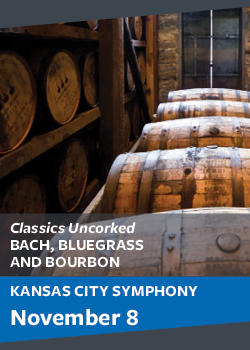 After the concert, enjoy a complimentary glass of wine while mingling with Symphony musicians in Kauffman Center’s Brandmeyer Great Hall with its sweeping views of downtown. A special selection of bourbons also will be available for tasting. Sponsored by BMO Wealth Management. Most tickets $25.